Planning your next Hawaii Vacation or looking for local happenings? Explore Hawaii Health Guide's events calendar for Molokai. 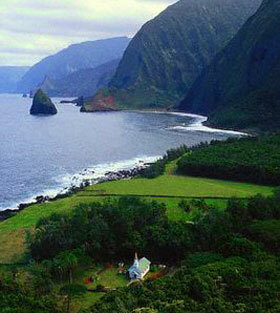 Explore the century-old leprosy settlement on Kalaupapa Peninsula. Ann O'Malley: The Story of Taro and links to Taro and Poi recipes. If you are recovering from the speed of modern life and need relief from "Road Rage" Molokai might be the place for you. No traffic and no traffic lights. A place where there are no buildings taller than a coconut tree. Molokai offers year-around good weather, the tallest sea cliffs in the world, ancient Hawaiian cultural sites, traditional fish ponds, a rural lifestyle and a genuine interconnected sense of Ohana. Check out Molokai Health Talk before kayaking the Molokai Coast or curing your saddle sores after a mule ride. The Molokai Health Guide can also help you locate medical facilities, massage therapists, unique accommodations, kayak rentals, and provide a safety guide to hiking and ocean sports activities.